How do I get my science project onto the International Space Station? February 21, 2017, Houston, TX — NanoRacks LLC has received NASA Johnson Space Center’s 2016 Small Business Prime Contractor of the Year award for the Company’s contributions and outstanding support in the form of hardware and services to the U.S. National Laboratory onboard the International Space Station. 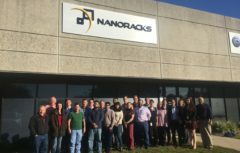 NanoRacks has a strong relationship with NASA Johnson Space Center (JSC), with the Company’s headquarters just across the street in Webster, Texas. With the International Space Station as NanoRacks’ prime platform, having close proximity to the team at JSC is crucial for day-to-day operations. The robust relationship with JSC has allowed NanoRacks to grow from initially providing research racks inside the U.S. National Labs, to creating plug-and-play research platforms, to being a leading provider of small satellite deployments in low-Earth orbit, and now to the building of the first-ever private airlock on Station. All with private capital working in partnership with NASA and the other space station partners. Earlier this February, NanoRacks announced that Boeing has joined as a partner in the building of the first-ever private airlock on the International Space Station. The NanoRacks Airlock Module is a critical step towards the transition to a more commercial ISS, with the potential to increase user capacity and the customer base. The goal for NanoRacks is to operate its own fleet of private space stations; both manned and unmanned. Those first steps are being taken in NASA’s award to the NanoRacks led IXION team to study re-use of in-space hardware for commercial habitats. Other team members are Loral and ULA. To learn more about NanoRacks and our journey into space, please email info@nanoracks.com. Be sure to follow NanoRacks on Twitter and Facebook for continued updates about the NanoRacks Airlock and our other commercial ventures.